(Nanowerk News) The secrets of why central-American jewel scarab beetles look like they are made from pure gold, has been uncovered by physicists at the University of Exeter. University of Exeter physicists specialising in colour and light have done experiments exploring the origin of the scarab beetles' striking metallic golden appearance, showing that the golden beetles have a unique 'optical signature'. The structure of the beetle and its armour uniquely manipulates the way the light is reflected so that it looks like pure gold. Their results are published in the Journal of the Royal Society Interface ("Optically ambidextrous circularly polarized reflection from the chiral cuticle of the scarab beetle Chrysina resplendens"). Professor Pete Vukusic, a physicist specialising in light and colour, led the research which involved experiments and advanced modelling. He found that the golden appearance is due to the high reflectiveness of the beetles' exoskeleton, which also manipulates a property of the light called its polarisation: the orientation of the reflected light wave's oscillations. The scientists mapped the optical signature of the beetle's Chrysina resplendens' colour, and found it was unusually 'optically-ambidextrous', meaning that it reflects both left-handed and right-handed circularly-polarised light. Professor Vukusic said: "The brilliant golden colour and distinctive polarised reflection from the scarab beetle Chrysina resplendens sets it completely apart from the hundreds of thousands of other beautiful and brightly coloured animals and plants across the natural world. Its exoskeleton has a bright, golden appearance that reflects both right-handed and left-handed circularly-polarised light simultaneously. This characteristic of Chrysina resplendens appears to be an exceptional and wonderfully specialised characteristic in currently known animals and plants. It will serve as a valuable platform from which bio-inspired optical technologies can spring." Other scarab beetles, valued by ancient cultures such as the Egyptians for use as amulets which were sometimes wrapped in the bandages of mummies, are a jewel-like green and blue colours. The vast majority of brightly-coloured beetles tend to be green and do not reflect polarised light. These beetles, in comparison to the brilliant golden colour of Chrysina resplendens, lack much more specialised aspects of their exoskeleton's finely detailed structure. Dr. Ewan Finlayson, research fellow on the project, said: "We were drawn to the study of this jewel scarab not only by its striking metallic golden appearance, but also by its ability to control a less obvious property of the reflected light: the polarisation. We have learned that there is great subtlety and detail to be found in these optical 'signatures' and in the elaborate natural structures that generate them." The spacing of the repeating layers of the nano-structures is found to vary over a specific range through the exoskeleton - a key property that causes the simultaneous reflection of a range of visible colours. It is this fact that explains the very bright reflection as well as the golden hue. Their nanostructures produce circularly-polarised light, where the orientation of the light's oscillations rotate as the light travels. The two possible directions of rotation are referred to as left handed and right handed. The experiments build on the work of an early American scientist called Michelson who, in 1911, looked at the polarised reflection from many different Chrysina beetles, and on the work of Anthony Neville (then at Bristol University) in 1971, who began looking more closely at Chrysina resplendens. One explanation for the highly-reflective appearance of the beetle exoskeleton is crypsis : the ability of the animal to blend in to its surroundings. Dr Martin Stevens, Associate Professor of Sensory and Evolutionary Ecology at the University of Exeter and an expert in animal vision, colour change and camouflage, said: "It is not absolutely clear why these beetles are a bright golden colour, but one option is that it somehow works in camouflage under some light conditions. The shiny golden colour could also change how the beetle is seen as it moves, potentially dazzling a would-be predator. There are many species which are iridescent but jewel beetles are one of the most charismatic and brightly coloured, and their colour might be used in mating. 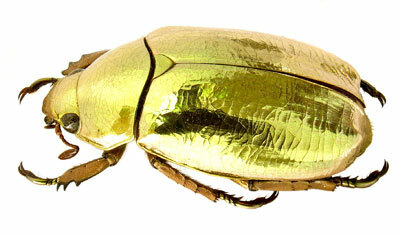 However, it is not clear how other beetles see the gold colour and reflected light. Many small mammals would not be able to distinguish the golden colour from reds, greens, and yellows, but a predatory bird would likely be able to see these colours well."